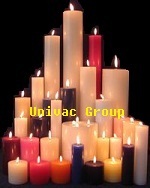 Univac Group India is well known acorss the world as an OEM manufacturer of highest quality scented cadnles, also carry our own 'Gypsy' brand candles. Our Candles are being exported to wholesalers and importers of USA, UK, Canada, Australia, Germany, France, Spain, Italy, Portugal, South Africa and south America. Our product range of candles include birthday candles, engagement candles, wedding candles, or anniversary candles, etc. This includes a varied range of candles such as T-light candles, votive candles, taper candles, pillar candles, rectangular candles, floating candles, soy candles, aromatic candles, novelty candles, container candles, window candles, gel candles, scented candles etc. We also accept candle orders with your own brand name, design, specification and style on any special occassions. * We make candles as per specifications to. * We offer a Sample kit worth 300 USD containing 30 items, weight approx. 25 Kg of GEL CANDLE RANGE. including freight for international shipping. * We also can send you our Sample kit worth 300 USD containing 60 items weight approx. 25 Kg. of PARAFFIN RANGE including freight for international shipping.